It's amazing what cleaning your glasses can reveal. A mineral-scouting instrument developed at ASU's Mars Space Flight Facility has found an outcrop of rock rich in carbonate minerals in the Columbia Hills of Gusev Crater on Mars, according to a report published online June 3 in the journal Science. 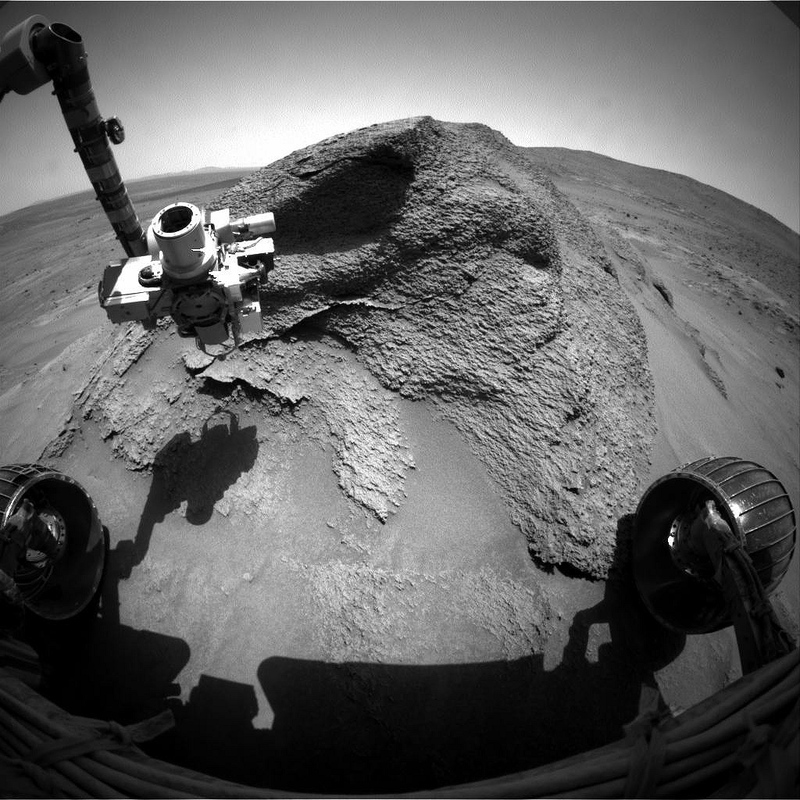 The instrument is onboard NASA's Mars Exploration Rover Spirit. What makes the discovery unusual is that Spirit visited the outcrop, dubbed Comanche, back in December 2005. Yet the data pointing to the discovery languished since then because one of the instruments that detected the carbonate minerals was partly blinded by dust. The instrument is the Miniature Thermal Emission Spectrometer, or Mini-TES, developed at Arizona State University. Each of the two Mars rovers carries a Mini-TES to identify minerals in rocks nearby. The instrument was designed by its principal investigator, Philip Christensen, an ASU Regents' Professor in the School of Earth and Space Exploration, part of the College of Liberal Arts and Sciences. "Mini-TES got dusted months before Spirit reached Comanche, and we didn't have a good way to correct for the dust effects at the time," said Steve Ruff, research scientist at ASU's Mars Space Flight Facility. Ruff is one of a team of scientists on the paper, whose lead author is Richard V. Morris of NASA's Johnson Space Center in Houston. "We knew there was something weird about the outcrop's spectrum as seen by Mini-TES, but couldn't say what caused it." Ruff added, "Spirit's Mössbauer spectrometer indicated that carbonate was possible, but I didn't believe it." What finally did the trick was developing a calibration to remove the spectral effects of the dust on the instrument. Combined with the Mössbauer data and chemical data from a third spectrometer, "the Mini-TES spectra put the discovery over the edge," Ruff said. Scientists have been searching for Martian carbonate rocks for decades because such minerals are crucial to understanding the early climate history of Mars and the related question of whether the planet might once have held life. "Small amounts of carbonate minerals have been detected on Mars before," Ruff said. The difference this time, he said, "is that we're seeing a couple of large outcrops of rock poking through the soil of the Columbia Hills. The rocks are about 25 percent carbonate by weight, by far the highest abundance we've seen on Mars." Comanche and a neighboring small outcrop dubbed Comanche Spur have the same granular texture and Mini-TES spectral nature. Ruff says they are part of a stack of volcanic sedimentary rocks, draped over the underlying terrain. "They're definitely a puzzle to understand," Ruff said. "The outcrops are very rich in olivine, a volcanic mineral, but they appear to have been soaked in water." He explains that it's as if the granular material settled over a preexisting landscape, then the entire stack was flooded with carbonate-rich water, probably from a hydrothermal source. NASA's other Mars rover, Opportunity, has discovered ample evidence for alteration of rocks by water in Meridiani Planum, on the other side of Mars from Spirit's Gusev Crater. But the water at Meridiani was strongly acidic. While life can evolve to survive in acidic conditions – such as in some of Yellowstone National Park's geysers and hot springs – few scientists think it can start under those conditions. Moreover, acidic water quickly destroys carbonate minerals, as for example vinegar dissolves hard water deposits. Thus finding outcrops of carbonate rock shows that the hydrothermal water at Comanche was liquid, chemically neutral, and abundant. While there's no evidence for life, Ruff said, the conditions would have been more favorable for it. Ironically, Ruff noted that the new finding complicates the story of the Columbia Hills. "This makes the geology harder to understand," he said. "It adds another environment to incorporate into the picture of how the Hills formed. "The Comanche data have been available to scientists and the public for about four years now," Ruff said. "The new finding shows that this data set still harbors potentially major discoveries." An article by Regents' Professor Michael Saks, entitled "Judging Admissibility," has been published in the current issue of the Iowa Journal of Corporation Law. Saks">http://www.law.asu.edu/LinkClick.aspx?fileticket=5SmCO5OjtnA%3d&tabi... is a Regents’ Professor of Law and Psychology, and a Faculty Fellow in the College of Law’s Center for Law, Science & Innovation. His research focuses on empirical studies of the legal system, especially decision-making, the behavior of the litigation system, and the law’s use of science. Saks is the fourth most-cited law-and-social-science scholar in the U.S., and has authored approximately 200 articles and books. Courses he has taught include criminal law, evidence, law and science, property and torts.